As moms, we can often feel like we don’t have any time for ourselves. Between our kids, households, chores, work, etc… where is the time to focus on what we want and need? 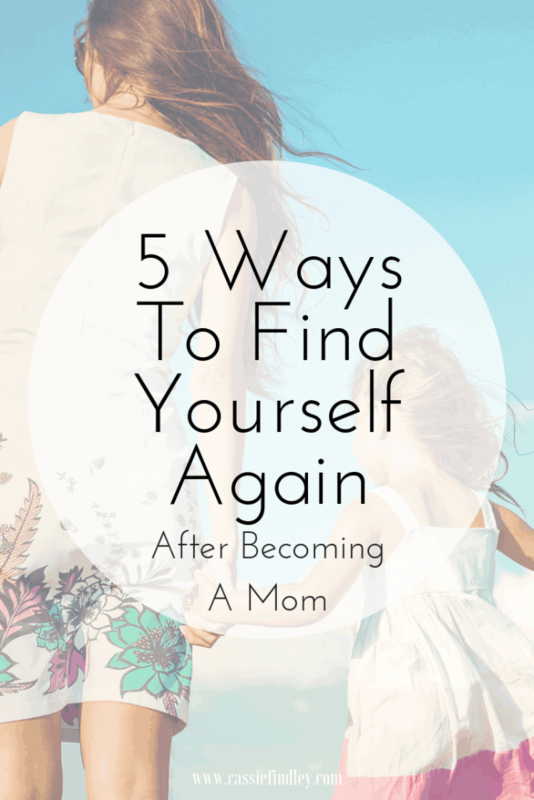 Below I have 5 ways to find yourself again after becoming a mom. Enjoy! About 2 weeks after I quit my job, my husband had his holiday company party. I was a little nervous because I knew people were going to be asking me what I did for a living. This was the first time I would respond; stay at home mom. He asked well what do you like to do for fun? I remember looking at my husband and then looking at him and was like… um, I watch Making A Murderer. That was my response. My hobby was watching Making A Murderer (which is very good by the way). Now, don’t get me wrong, I personally think watching tv is a perfectly fine hobby, but I “watch” tv as in it’s on in the background when I do other things. Its not really a hobby of mine. DUH. Did you think I would have any other advice?? Ha. Seriously though, make a list (brain dump) of all the things you used to like doing as a kid. Things you liked doing before you become a mother. Things you wish you had time to do. Assess that list; does any of that sound fun to you now? Here is my list: exercise, cleaning, organizing, coloring, being outside, blogging, planning. Now look at that list. Do you want to do any of that? Using my example, exercise is something I want to be a hobby again. I know I enjoyed it and would enjoy it now, but getting back into it has been difficult. Cleaning, organizing, blogging, and planning are all things I do within this blog which is definitely a hobby of mine. I don’t really like coloring anymore, so I will scratch that. I enjoy being outside in specific context, I like walking, hikes, and yard work. 2. Make time for what you enjoy. Do a time audit; assess how you are using your time within the day. Are you really that busy that you don’t have 15 minutes to work on that hopeful hobby of yours? What can you remove from your day to make more time? Less scrolling? Less tv? Ask for help to allow more time for what you really want to do. Just because you want to do something, doesn’t mean it will just magically happen. Even if you really want to do it. As I mentioned before, something I use to love (exercise) has been really difficult for me to get back into. I need to set aside time for it, have the supplies ready, and push myself to do it so it can become routine for me again. If someone asks me what do you like to do in your spare time; responding with cleaning and organize might feel silly, but its the truth! Cleaning and organizing calms me down and I enjoy it! It is what it is ya know? Own what you enjoy doing! What is something new you want to start/explore as a hobby? This post really hits home for me! I can’t tell you how many times I’ve been asked what my hobbies are and my only response is “taking care of my kids.” I’ve been a single mom for the majority of the last 10 years, so I didn’t even remember what my hobbies were before I had kids. I did a pretty big brain dump last summer and wrote down every little thing I enjoy. Maybe it’s not specifically a hobby (coffee isn’t a hobby, is it?) but it helped me learn more about myself and who I am outside of being a mom. It is still a daily struggle for me, but I am slowly becoming more than just Mom. I love the blog! It was very informative.